On Oct. 2, the Southeast ADA Center, a project of the Burton Blatt Institute at Syracuse University, will launch “ADA Live!” on WADA, the center’s Internet-based radio station. For the past 22 years, the Southeast ADA Center, a member of the ADA National Network, has provided free, confidential and accurate information, training and technical assistance on the Americans with Disabilities Act (ADA) to individuals who have rights under the ADA, as well as to those who have responsibilities under the act. 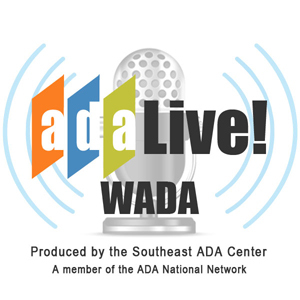 WADA “ADA Live!” will broadcast live on the first Wednesday of each month from 1-1:30 p.m. ET/noon-12:30 p.m. CT. “ADA Live!” programs provide up-to-date information on the ADA and allow anyone to call in with their ADA questions. “ADA Live!” will also expand the center’s outreach to youth, young adults and members of racially/culturally diverse communities throughout the Southeast region. WADA “ADA Live!” is supported through a fully accessible and interactive website at http://www.adalive.org. The public can get up-to-the minute program information, submit questions for upcoming “ADA Live!” episodes and participate in the online group discussions. Real-time captioning will be available during the live shows. Recordings of past episodes, including a transcript, resources and more information will be available at http://www.adalive.org.